Hon. Consul General of Nepal to Victoria, Chandra Yonzon, participated in Non-Resident Nepalese Association Australia, Victoria’s Community Consultation Forum at Nepal Consulate Office on Monday, 27 August 2017. Consul General Yonzon made part of the forum panel along with four other reputed senior members of Victoria’s Nepalese community. Consul General Yonzon took notes and addressed attendees with concrete feedback as to how NRNAA Victoria can work more closely with the community and more effectively in the future. Hon. Consul General of Nepal to Victoria, Chandra Yonzon, attended as Chief Guest at Sagarmatha Cricket Club’s (SCC) first Presentation Night to celebrated SCC’s accomplishments over the past four years accompanied by wife, Laxmi Yonzon, on Sunday, 27 August 2017. The program commenced with the national anthems of Nepal and Australia before a minute of silence for the victims of the recent floods in Nepal. SCC pledged to hand over $5 from each ticket sold on the night to NRNA’s disaster relief fund with a donation box at the venue with attendees encouraged to donate. Hon. Consul General of Nepal to Victoria, Mr Chandra Yonzon, hosted South Asian Games (SAG) gold medallist and current national Nepalese karate team coach, Mr Kushal Shrestha, SAG silver medallist, Mr Ram Bahadur Limbu, and former National Sports Council (NSC) Executive Board Member, Mr Lal Kumar Lama, at the Nepal Consulate Office on Friday, 11 August 2017. Mr Yonzon presented guests with ceremonial khada before discussing how to increase the promotion of sportsmen and women in Australia and abroad. Hon. Consul General of Nepal to Victoria, Chandra Yonzon (चन्द्रयोन्जन), made part of a Nepalese delegation which was welcomed in Bendigo on Sunday, 30 July 2017. Welcome Session for the Nepalese Ambassador to Bendigo, organised by AusNep Foundation Inc. and Rotary Club of Bendigo, in association with Consulate General of Nepal to Victoria, was held to welcome Ambassador of Nepal to Australia, Her Excellency Lucky Sherpa, and delegation to Bendigo. Honorary Consul General of Nepal to Victoria, Mr Chandra Yonzon, Honourable Deputy Prime Minister of Nepal and Minister of Education, Mr Gopal Man Shrestha, and dignitaries accompanying the Hon. Deputy PM attended a civic welcome with community members and media in attendance at the Bendigo Town Hall on Wednesday 19 July 2017. Bendigo Council, including Mayor Councillor at the City of Greater Bendigo, Ms Margaret O’Rourke, and Nepali dignitaries discussed Australian technical and vocational education training to develop the TVET Policy program in Nepal. The Hon. Deputy PM and accompanying dignitaries are scheduled to return to Nepal following their official visit to Victoria on Sunday 23 July. Hon. Consul General of Nepal to Victoria, Mr Chandra Yonzon, received the Honourable Deputy Prime Minister and Education Minister of Nepal, Mr Gopal Man Shrestha, and Education Ministry, National Planning Commission, Finance Ministry, Council for Technical Education and Vocational Training (CTEVT), representatives of skills development projects and other government sector representatives at Tullamarine Airport, Melbourne, on Saturday 15 July 2017. The dignitaries were accorded a warm welcome and were presented khada shawls. Prominent community members and media personnel were in attendance. The Honourable Chairman of the Public Service Commission (PSC) in Nepal, Mr Umesh Prasad Mainali, and his team, were welcomed with traditional khada shawls by Melbourne’s Nepali community leaders, including the Hon. Consul General of Victoria, Mr Chandra Yonzon, and his wife, Laxmi Yonzon, with media in attendance, at Melbourne Airport on Saturday 22 April 2017. The Honourable Chairman and delegates are in Australia to meet with Professors at the University of Technology Sydney (UTS), where they will attend a seminar and share ideas on public policy, human resource management, and personal selection methodology. The Hon. Consul General to Victoria, Mr Chandra Yonzon, and his wife, Mrs Laxmi Yonzon, attended a fundraising dinner on the auspicious occasion of Nepali New Year 2074. The dinner, with the aim of raising money for a Nepali community centre, was organised by the Australian Nepal Multicultural Centre (ANMC), and was held at Estonia House on Monday 17 April. Seven Women Australia, an NGO, held a fundraising event for the Nepal Earthquake victims on Friday 19 June 2015. This event included a sale of handmade products by the members of the association, a raffle and an auction. Around $15,000 was raised through the help of its generous patrons the same evening. 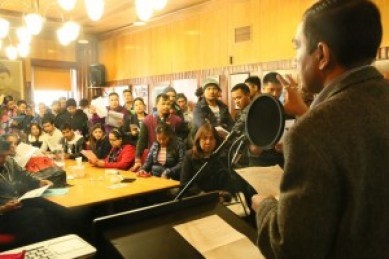 The Nepal Embassy officials along with the Nepal Consulate in Melbourne conducted a two-day info session on the new MRP passport. Conducted on Saturday & Sunday, 6th & 7th June 2015, around 700 applicants had their applications processed over these two days.